As governments convene in Morocco for this year’s meeting of the United Nations Framework Convention on Climate Change (UNFCCC), the impact of a changing climate continues to be felt several thousand miles to the north. According to a report covered by ISNA, this year’s minimum Arctic sea ice extent tied with 2007 for the second-lowest on record, and its regrowth in fall and winter is proving to be sluggish. From Oct. 1 to 15, ice extent increased by less than one-third of the 1981-2010 average gain for that period; by Oct. 31, Arctic sea ice extent stood at 2.73 million square miles, the lowest extent in the satellite record for that date. Meanwhile, a new study in the journal Science argues that computer models have been underestimating Arctic sea ice loss, and that the region could become effectively free of summer sea ice by 2045. The study compared annual human-caused greenhouse gas emissions with observations of September Arctic sea ice extent over the period 1968 to 2000. They found that the two elements had a strong linear relationship, to the extent that it was possible for them to calculate that every additional metric ton of carbon dioxide emitted into the atmosphere resulted in the loss of about 33 square feet of Arctic sea ice. This enabled them to come up with a way of showing how individual actions contribute to changes in the Arctic. For example, they calculated that every seat on a flight from London to San Francisco comes at a cost of about 54 square feet of sea ice. The annual carbon emissions of the average American would be enough to melt about 500 square feet — nearly 10 times as much as the average Indian, for example. “So far, climate change has often felt like a rather abstract notion. Our results allow us to overcome this perception,” said Stroeve. Researchers then used their discovery to look at the Arctic’s future, and found that an additional 1,000 gigatons of carbon would be enough to reduce Arctic sea ice cover in September to below 386,000 square miles — which, given that that ice would be tucked into a few pockets such as northern Greenland, would effectively render the Arctic Ocean ice-free. At present rates of CO2 emissions, which are around 35 gigatons per year, that scenario would unfold by around 2045. They found that the extent of ice loss outpaced that in most computer models, because those models likely underestimate the amount of Arctic warming that is taking place. 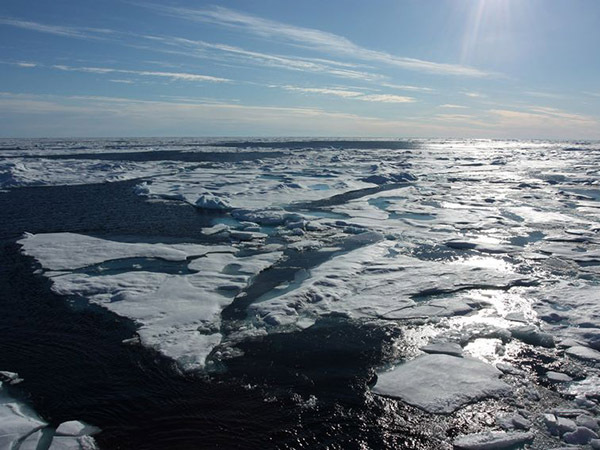 Measurements of air temperatures above the Arctic Ocean remain limited.